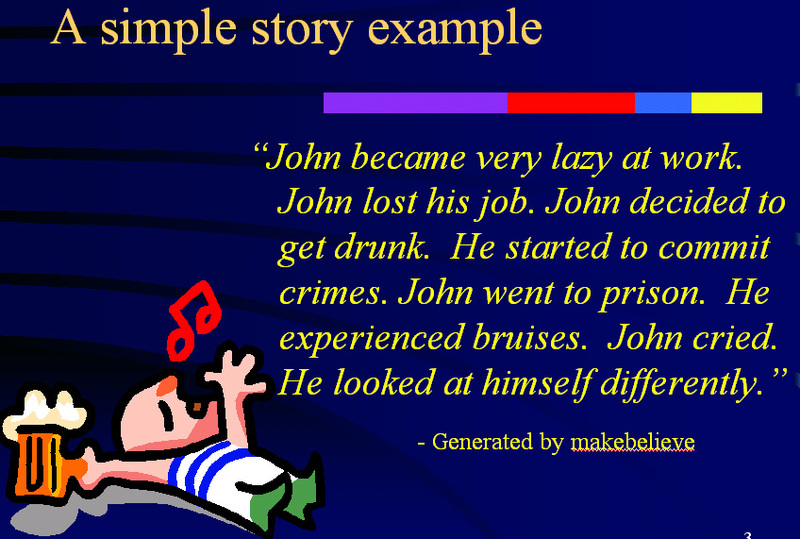 MAKEBELIEVE is a story generation agent that uses Open Mind knowledge to interactively compose short fictional texts with a user. While a user must start a story, MAKEBELIEVE will attempt to continue that story by freely imagining possible sequences of events that might happen to the character the user has chosen. The agent uses "commonsense" about causality and how the world works, mined from the Open Mind Common Sense corpus, and combines this with very simple lingustic techniques for story generation to produce pithy but interesting stories. MAKEBELIEVE also uses commonsense to evaluate and critique a story it has written to catch logically inconsistent, incoherent events and actions. Some next steps we are working on include expanding stories for multiple characters, and reworking the story generator as an educational tool for kids. We hope to incorporate social commosense about interactions between characters to imagine possible interaction scenarios. By making MakeBelieve more of a game, we might be able to use this as an educational opportunity to teach younger kids about consequences and story writing.